From Matthew 1:20–25; 2:1–11; and Luke 2:1–20. 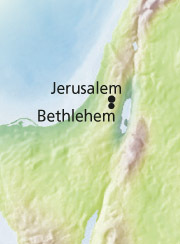 Darkness crept softly over the green hillsides near Bethlehem. It was spring, the season when many new lambs were born. Busy shepherds checked on one lamb and then another before settling down for the night. Bethlehem was busy as well. Many travelers had come to the village because the Roman emperor had decreed that all people must go to the city of their ancestors to be taxed. Two of the travelers﻿—Joseph and his wife, Mary﻿—had to find a place to stay for the night. At last Joseph and Mary found shelter in a stable, where animals were kept. In that humble stable Mary’s baby was born. The baby was the Son of God, the Savior of the world. Mary wrapped her baby in clean swaddling clothes and made a little bed for Him in the soft, clean hay of the manger. Joseph knew that this baby was the Son of Heavenly Father. He named the baby Jesus, just as an angel had told him earlier. The angels of heaven rejoiced! The prophets’ promises were fulfilled. Jehovah, now called Jesus, had been born on earth. A new star shone in the heavens to announce the good news. On a hillside an angel appeared to shepherds, and a bright light shone all around. The shepherds had never seen such a thing, and they were very afraid. When the angels left, the amazed shepherds hurried to Bethlehem, where they found the baby Jesus lying in the manger. As the shepherds returned to their sheep, they praised God and told others of all they had seen. City of David: David, the young man who fought Goliath and later became king, was born in Bethlehem. City of David is another name for Bethlehem. Manger: A box or trough made of wood or stone to hold food for animals. Star: The Wise Men, who lived in the east, far from Bethlehem, saw a new star. They knew it meant the Savior had been born. They traveled to visit young Jesus, who would be King of the Jews. They brought Him precious gifts of gold, frankincense, and myrrh.